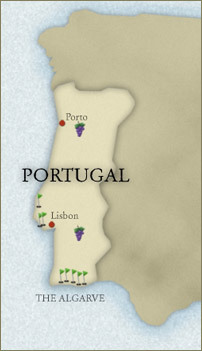 Portugal is a destination that was made-to-order for a CORK & TEE epicurean golf vacation. Based on our inspections in 2008, we can verify that this compact nation is home to some of the best golf venues on the continent. Moreover, we’ve long known that the wines here are exceptional, from the renowned Ports of the Douro Valley to the great hidden-gem reds of the Alentejo and the crisp whites of the north. And the cuisine is as unique as this nation thanks to a rich bounty from the sea. Once occupied by Romans and then by Moors, Portugal has been a unified country since 1297 and is well known as the launching pad for some of the grand expeditions by the likes of Vasco da Gama and other celebrated explorers. This nation was first to discover ocean routes from Europe to Asia that yielded great prosperity. In Portugal, you will discover a most beautiful country – from the wild mountains of the Minho in the north to the spectacular secluded beaches of the Algarve. 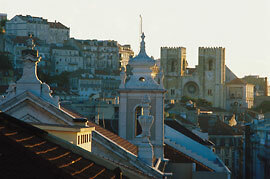 Lisbon, its capital, is quite compact and reminds many Americans of San Francisco. The nearby Atlantic Coast is stunning, the Douro Valley, a CORK & TEE favorite, features steep slopes, making it one of the most beautiful wine regions in all of Europe, and the rolling hills of the Alentejo invite a certain sense of serenity. In between, there are delightful as well as historic towns and villages including Evora, Obidos, Alcobaca, Cascais and Tavira in the Algarve, among others. It may come as a surprise to many that Porto, Portugal’s second city, is home to the second oldest (1890) golf course in Europe (Oporto Golf Club). Along the southern coast in the Algarve, choose from more than 30 golf courses including CORK & TEE Destination Courses such as Monte Rei, Vilamoura-Old Course and Quinta do Lago. On the coast near Lisbon is Oitavos Dunes, reminiscent of Oregon’s Bandon Dunes, Praia del Rey, a manicured, links-style course along the Atlantic and the challenging resort course of Penha Longa, the Ritz-Carlton property in Sintra. 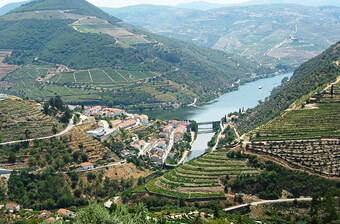 We also can enable insider experiences to help you appreciate Portugal’s rich tradition of fine winemaking. Ride in an authentic rabelo boat used for centuries to transport wine barrels down the Douro, learn about the eclectic mix of grapes that are used to make the Alentejo’s reds and understand the growing role that Cabernet, Merlot and Syrah play in the Portuguese wine industry. Epicurean experiences, which we offer throughout the country, very much center around seafood. Why not come away from a visit to Portugal with a fresh approach to cooking seafood? You may even come to love grilled sardines as we do! Our friends in Portugal remind us that it’s important to keep it simple, so that the seafood is the star. 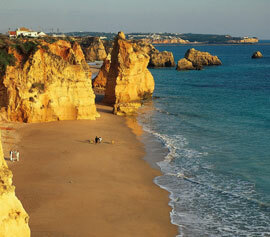 Come experience Portugal. Let us handcraft an exceptional itinerary to expose you to the greatness of this nation.